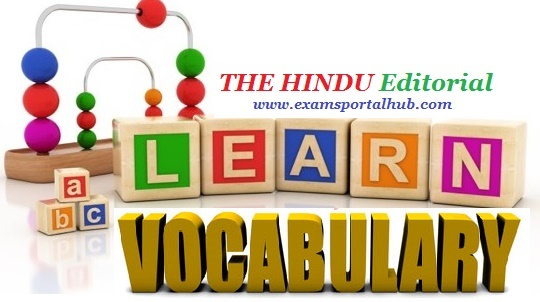 THE HINDU Editorial Vocabulary - October 9, 2018 - Hard justice - COMPETITIVE EXAMS PORTAL HUB -Best for UPSC Civil services, SSC, IBPS and All Govt jobs,India. The U.S. Senate has confirmed the nomination of conservative-leaning judge Brett Kavanaugh, by a vote of 50-48, and he was sworn in as a ninth justice of the Supreme Court (SCOTUS). The narrow victory of the second successful nominee of President Donald Trump to the highest court came after a furore involving allegations of sexual misconduct levelled by Christine Blasey Ford, a Professor of Psychology. Under pressure after Ms. Ford came forward, the Republican majority on Capitol Hill agreed to an FBI inquiry into the allegations against Mr. Kavanaugh. While the FBI was limited to a tight deadline, given a predetermined list of persons it could interview, and constraints on the kind of evidence it could obtain, no conclusive evidence of wrongdoing emerged. Mr. Kavanaugh now takes the place of retired Justice Anthony Kennedy, a judge seen as a potential swing vote on contentious issues such as marriage equality. Chief Justice John Roberts is also considered by some to be a potential swing vote, as he was in the case that established the legality of former President Barack Obama’s Affordable Care Act. This, then, is the critical question facing American jurisprudence: has the rightward tilt of the SCOTUS intensified with Mr. Kavanaugh’s confirmation? Including him, five of the nine justices now lean conservative. Liberal-progressive America may understandably fear that the country is on the brink of a new epoch of politics and social justice that could herald a rollback of hard-fought freedoms in areas such as women’s reproductive rights, voting rights, LGBTQ rights, rights of racial or ethnic minorities, immigration reform, and environmental controls. Given Mr. Kavanaugh’s past rulings on assault weapons bans, religious liberty rights and the constitutional rights of large financial corporations, his rulings in future cases may well favour conservatives — for example, by giving the Second Amendment on the right to bear arms more teeth, by potentially re-opening Roe v. Wade on abortion, or by allowing state-level challenges that go against the marriage equality tenet implied by Obergefell v. Hodges. A closely watched area in which the newest justice may have to rule is whether the U.S. President is immune to criminal prosecution, especially since Mr. Kavanaugh helped write the Ken Starr Report calling for the impeachment of President Bill Clinton. Would he still stand by sections of that report that argued in favour of an impeachment for lying? Taking a step back from the Kavanaugh nomination, it is evident that even if Democrats are in a strong position to win back the House of Representatives in the coming mid-term elections, control of the White House, the Senate and SCOTUS gives the Republican Party a magnitude of control rarely seen in recent times, and with it the power to reinsert conservative values into the heart of American democracy. Allegation: a claim or assertion that someone has done something illegal or wrong, typically one made without proof. Misconduct: unacceptable or improper behavior, especially by an employee or professional person. Predetermine: establish or decide in advance. Legality: the quality or state of being in accordance with the law. Herald: a person or thing viewed as a sign that something is about to happen. Tenet: a principle or belief, especially one of the main principles of a religion or philosophy. Reinsert: place something back into its previous position.